The Downfall Of Lady Une Click above link to play audio title and comments from Heidi and Indy. Heidi says: "The Downfall of Lady...Une?" Indianna shows dislike: "Yeah, that's her." Rank: Yeah, she stinks to high heaven. DOB: Sept. 20, 1976 The secret is out! Personality then: Blood-thirsty, power-tripping, maniacal, sadistic tyrant! She can also wax all mellow peacefulness, but that doesn't mean she really is. Lady Une is the type that will make sappy peace speeches one minute and try to rip your kidneys out the next. 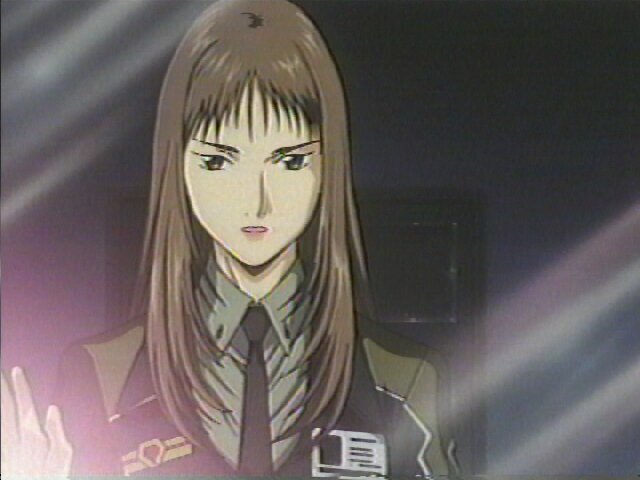 Oh, and she's got a terminal case of the hots for a terrorist with the sissy name of Treize Khushrenada, who tries to put on an air of being classy, but you know he's just a manipulative, power-hungry phony and a user! Just as well he gets dead during the GW series. Lady Une is the main villain and the residential W-E-N-C-H in this story! She is a slap-happy, murderous, tyrant!